Five Computer Science students won 2nd Prize at the Hack Your Tech 2018 competition held on August 26, 2018 at Bits & Bytes Hall, Faculty of Information and Communication Technology (ICT). Mr. Pan Teparak, Ms. Atidhaya Yoochanachon, Ms. Siripatsorn Sirichai, Mr. Nuttapat Koonaransri, and Mr. Supanut Thongnumchaima, Computer Science students from Mahidol University International College (MUIC), received 30,000 Baht as prize money for their winning entry, an application called “LookLaan (ลูกหลาน).” It is an application designed to help the elderly in paying their electricity, water, cellphone and other bills online through the use of voice command. 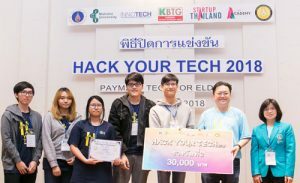 The Hack Your Tech 2018 event was sponsored by the Ministry of Science and Technology, Kasikorn Business Technology Group (KBTG), Institute for Technology and Innovation Management (INNOTECH) of Mahidol University, and the Faculty of Information and Communication (ICT) of Mahidol University. It aims to support the development of digital software for new innovations which can serve users as well as increase the potential of businesses in Thailand.